This day belongs to Janine B. "Blue and black...such a rocking combination! Bubbles and bunny bonnet simply beautiful. Thank you for making my birthday a memorable day." Bun fascinator donated by Mary Pattavina of Pretty Good Things, Necklace handmade and donated by Icelandic designer Elín Bríta, tights from Sockdreams and vintage pumps from eBay. Hello blue girl, That necklace is "interesting"..Love those pumps. Payal tagged this True blue! There's something so calming about this look. That necklace just works! 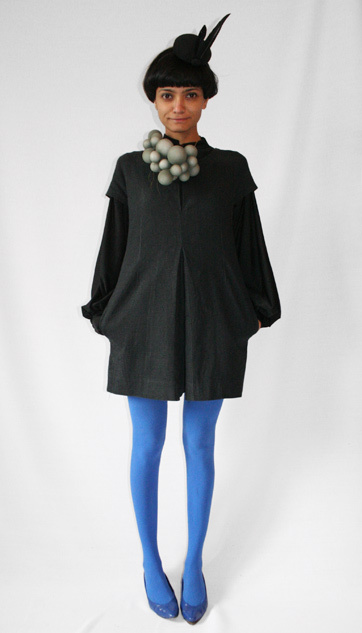 love how the colors necklace and tights blue grey and black create an (icelandic? )smurfette mermaid theme...loooooove it! Anonymous tagged this Oh Mamy! holly tagged this Strong graphic pop! Is that a thread I see hanging off the hem in Photo 2? I work as a costume stand by, and that's the sort of thing that would have me running on set in final checks to remedy! I like the simplicity of the silhouette, particularly the voluminous sleeves. shuchi tagged this cosmo chic! love that you keep things fresh and new...and blue! have you ever worn the dress upside down? Your hat strikes me as something that might happen if Robin Hood went to work as a trendy French chef making amuse-bouche hors d’œuvres. I really love this look; very elegant with interesting art touches. Really great necklace. and the link is... http://colormaven.wordpress.com/2010/03/04/bubbly-blue-and-brilliant/ I would rather have this than all the blue in the world. (Quote adapted from Maggie Nelson in Bluets pg 95). Super cute!!! Love the necklace you are wearing!! Adorable! It is like a bubble of vintage elegance! Thought you might be interested to know that the necklace you're wearing can fittingly be described as "botryoidal": a marvelous adjective that one has so few opportunities to use, it means "shaped like a bunch of grapes". Keep up the good work! Oooh, that's a ballsy one! I don't get this project. At all. Your dress is nice. But looks designer-ish, innit? So much for poor children. Hmmmm. May be time to get down and do some real work. What say? I'd go down the rabbit hole in those tights! May I suggest clicking on the 'About'button on the top left corner of the page to find out more about the project and dress. Yes, it is designer, and a fabulous one at that! Not all of us can get down to the kids all the time, so you do the best you can. She's collected almost 56 grand in 307 days to put 155 kids in school. And taught over 3000 of us across the globe about sustainable fashion! I reckon that's pretty awesome, don't you? i love the necklace! those icelandic sure know how to make things unusual! I am just in love with those fascinators! One day I will be brave enough to wear one. love the blue pumps and the necklace still! Yes, it is a designer dress. But doesn't every dress have to be "designed" at some point? And it is not like this is one of those "handstitched-by-viola-playing-Zimbabwian-goats-and-then-baked-in-Russian-Honey-at-low-temperatures-for-10-years" kind of designer dress. It is just a no-frills, thoughtfully designed practical dress - that already gave many of us hope that it will be one of the last LBDs we are ever going to buy. How many cheap dresses are out there, which are just never quite so simple and versatile, because the retailer wants you coming back next season? Even if Sheena hadn't raised more than 55,000 bucks for the education of children, she still has the potential of saving earth millions of LBDs made in vain and made thousand across the globe more conscious about our wasteful consumer behaviour. And I know, she gave me (and I am sure many others) 307 reasons to smile this last year! Hmmm, sometimes the outfits go past the realm of viable alternatives on how to wear the LBD and into costume territory. This feels like one of those times. That said, I love the colors, the drama, and the statement. My life would be complete if I had a bun fascinator. Ma chou! You and your cockles and baubles are simply smashing au jour d'hui. The slight jaunt of the classique hat offset by ultra-mod neck gear makes for an intergalactic fashionista transcending space and time. Bowie meets Bjork, because he sang about electric blue and she'd totally wear that necklace, because it's awe-inspiring. @ Benjamin: Is 'botryoidal' an actual word? Because it's awesome and i'm so using it the first chance i get. If i can get round to pronouncing it correctly. i want that necklace in my hand right now! !...how do i get one? It's a bit funny how many non fashionable people put their comments on this site. Fashion is not jeans+tshirt, it about finding you own personal style and looking inspiring & beautiful. I love the look, its inspiring, graceful & edgy. Perfect combo, love the project.